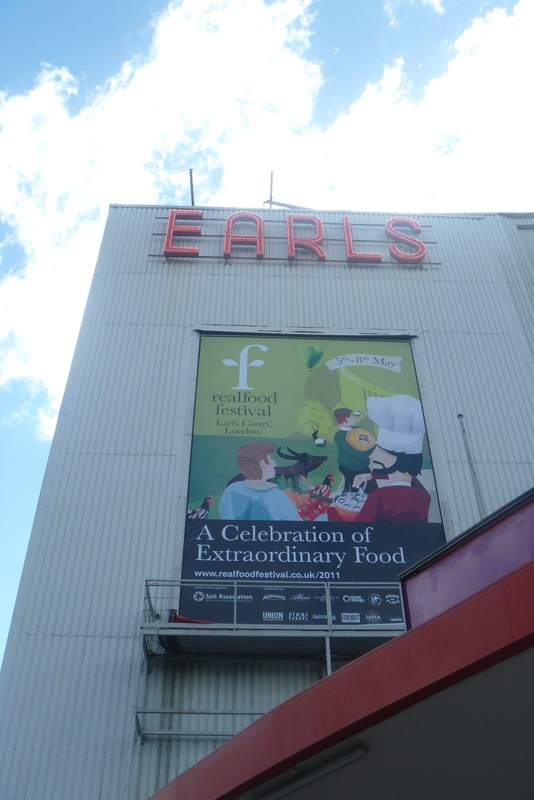 On Sunday, I went to the Real Food Festival at Earls Court with my hubby and kids. Having kindly been given tickets by Nick Coffer from My Daddy Cooks, we embarked on the train journey (an adventure in itself for the little ones) to Earls Court. 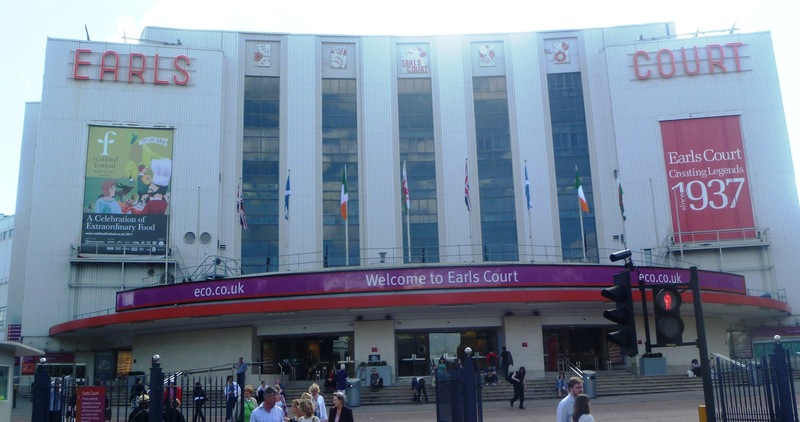 We had been warned, through twitter, to go with empty stomachs and as we entered Earls Court and the delicious smells of different foods wafted towards us, it was soon clear to see why. The Real Food Festival was foodie heaven and gave us the chance to sample and buy products from a mixture of carefully selected producers. In addition there were chef demonstrations, kitchen workshops, buffalo to interact with, dancing sheep, and a kids taste tent. We worked our way around the festival sampling gorgeous oils, chutneys, wines, ports, chocolate, breads – you name it, it was there. 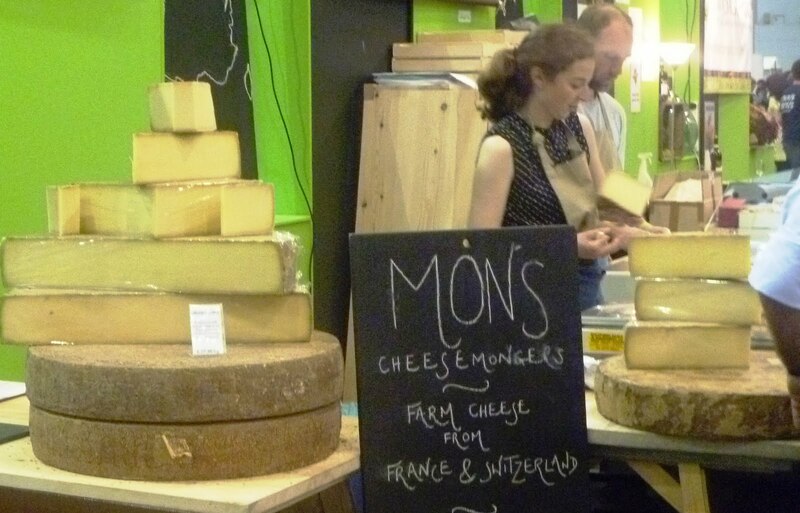 Sampling from the source gave us a chance to speak to local producers and hear how their products had been produced from the planning stages, through to the point of sale. Soon after entering the festival, we found a little stall being manned by two lovely ladies from Kitchen Garden Preserves. 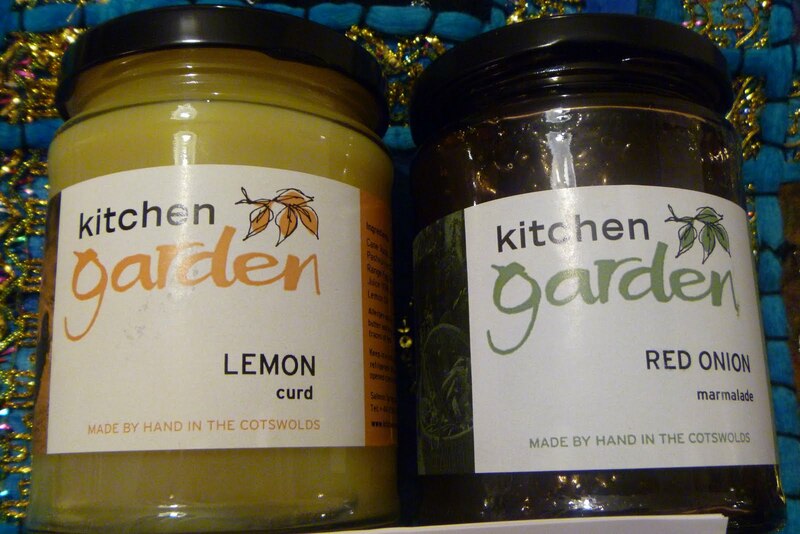 Run by Robin and Barbara Moinet since 1989 and based in the Cotswold’s, Kitchen Garden Preserves makes high quality jams, chutneys, preserves and condiments which are sold through their website and independent retailers. 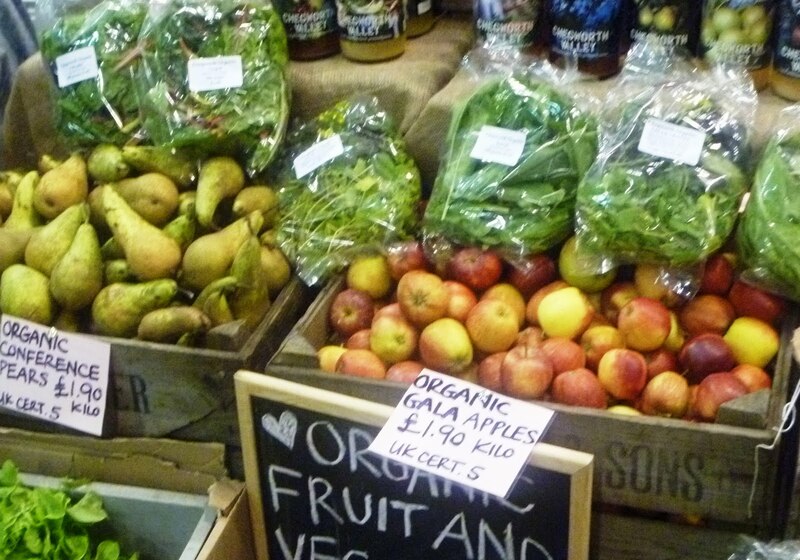 All of their products are handmade, using fresh ingredients sourced from local producers. They don’t contain additives and are gluten and GMO free. Most importantly for me, they are also mostly suitable for vegetarians! We met Barbara who was so lovely and encouraged my 4 year old to try whatever she wanted (others in the festival were not so keen to let kids near their wares!). 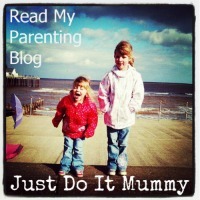 My daughter loved the strawberry jam and it was clear to see that Barbara loved her products and telling us about them. I myself developed a penchant for the luxuriously lemony lemon curd. I purchased this, along with one of their new products - red onion chutney which I was assured is delicious with goats cheese. After browsing their website when I returned home, I was also delighted to find that they offer recipe ideas for their products. 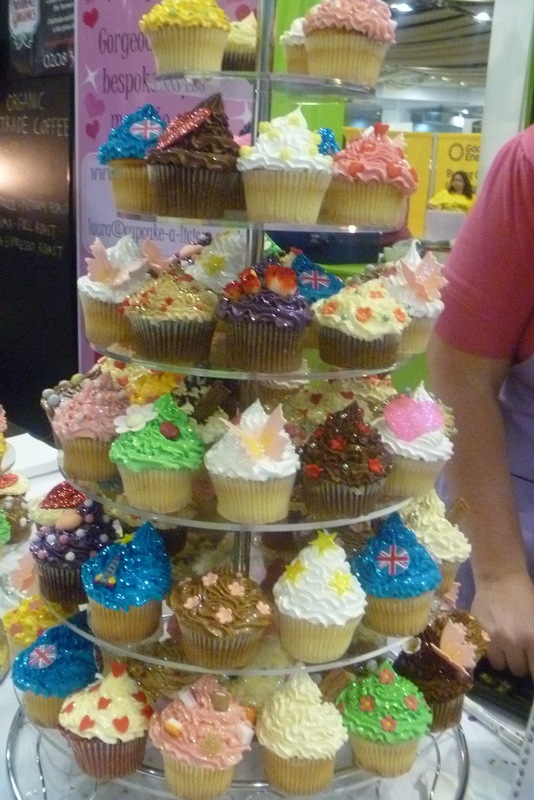 We can’t wait to try the lemon curd fairy cakes! Another brand I found was the Wormersley brand which has been made in Yorkshire since 1979 and is now run by the lovely Rupert Parsons. Wormersley make vinegars and jellies from home grown herbs and fruits. They also have really beautiful artwork on their bottles! I shall be displaying my bottle of Strawberry and Mint Vinegar as soon as I have consumed its contents. I can’t wait to try the vinegar in a fruit salad or poured over some fresh British strawberries – divine!. There were lots of chef demonstrations going on, but being with small children, we were only allowed to watch the entertaining ones that they would sit through. 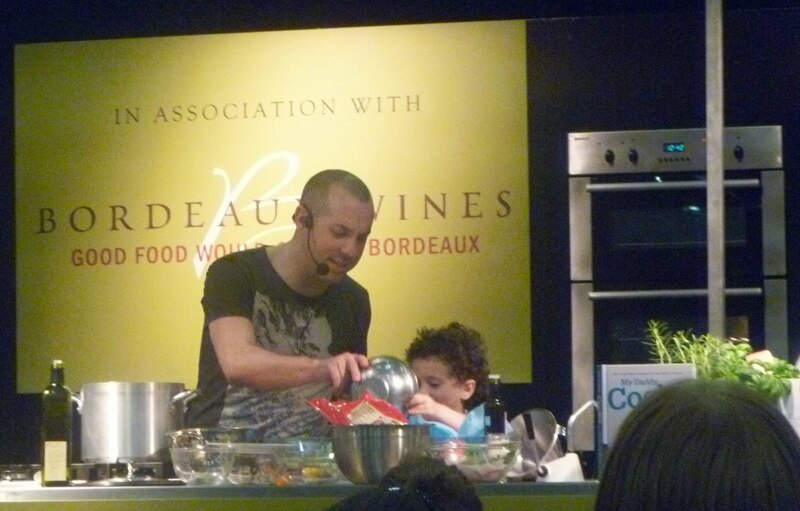 We had a lovely time watching Nick Coffer from My Daddy Cooks cooking with his son Archie. Nick did a fantastic job cooking a “Mexican Lasagne” and “No Cook Pasta” from his new cookbook (soon to be released) and Archie had terrific fun using up all of his Daddy’s ingredients in a dish of his own! Mid afternoon, I attended my first ever tweet-up which was excitement in itself. It was lovely to catch up in person with Ren from Fabulicious Food, Laura from My Secret Kitchen and food lover Working London Mummy. 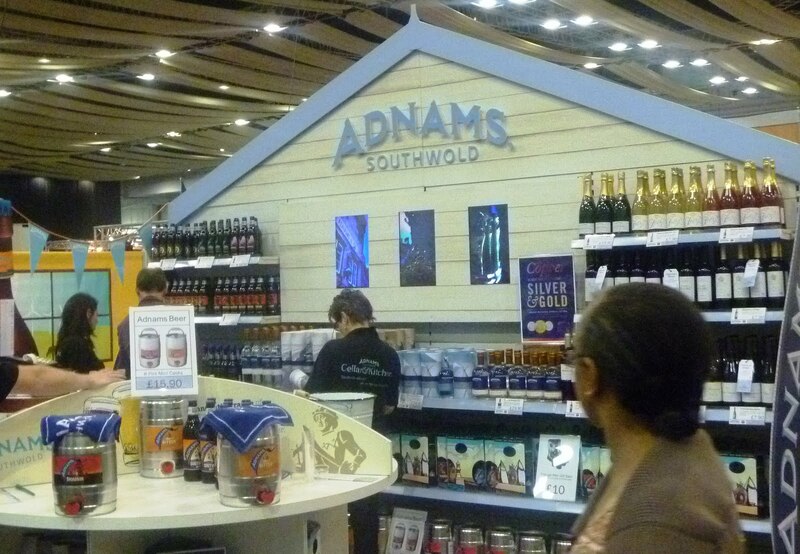 Other producers we enjoyed visiting were Adnams brewery from Southwold – a local brewer close to our hearts since Hubby has ties to Lowestoft. We were stunned to find they also produce wines and spirits in addition to beers and we will definitely be booking in a tour of the brewery when we next visit Suffolk. Next, I was interested to discover Vegetarian Caviar at Caviar 4 Everyone as it’s something I haven’t come across before. Upon sampling, I decided that it was not personally my cup of tea, but good to know that vegetarian caviar exists! My daughter who is mad about anything pink and sparkly found herself drawn to the glitteriest cupcakes in the world made by cupcake-a-licious. The cupcakes all looked beautiful, but sadly, I begrudged paying extra for a box to transport these delicate treats when the cupcakes were already pretty pricey and so she just bought one to eat immediately, which she thoroughly enjoyed. Cake-wise, I myself preferred the chocolate brownies made by Kate at Gower Cottage Brownies. Kate runs her business from Gower Cottage in Wales. Her brownies were really fresh, light and airy, had a rich chocolate taste and melted in the mouth - delicious! Another highlight was chatting with leading gardening charity Garden Organic. Funded by private donations, grants and lottery funding, Garden Organic has launched the “One Pot Pledge” which aims to encourage 30,000 people to grow their own food for the very first time. We came away with small rocket and lettuce plants to cultivate and we look forward to helping them grow. My last recommendation will go to Scarlet Angel Ltd which I found just as we were leaving the festival. 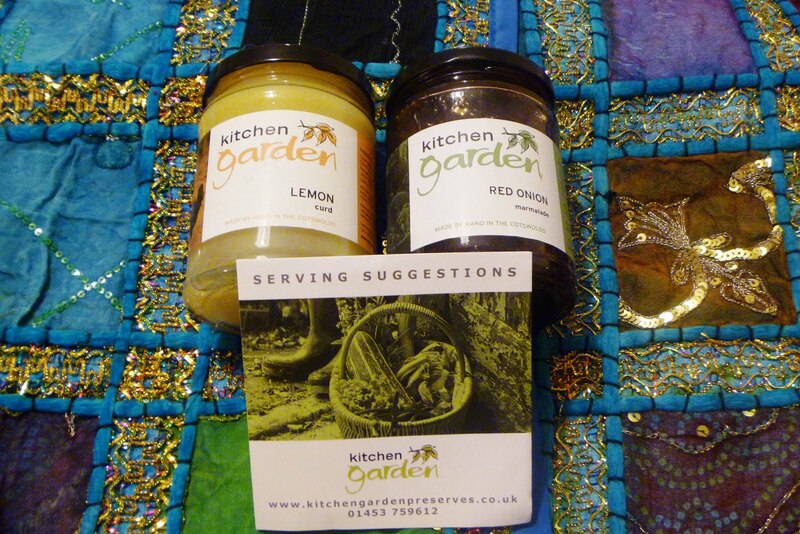 Scarlet Angel based in Gwent and run by Bronwen Ramsay, make organic dressings which can be used in salads or as dips. 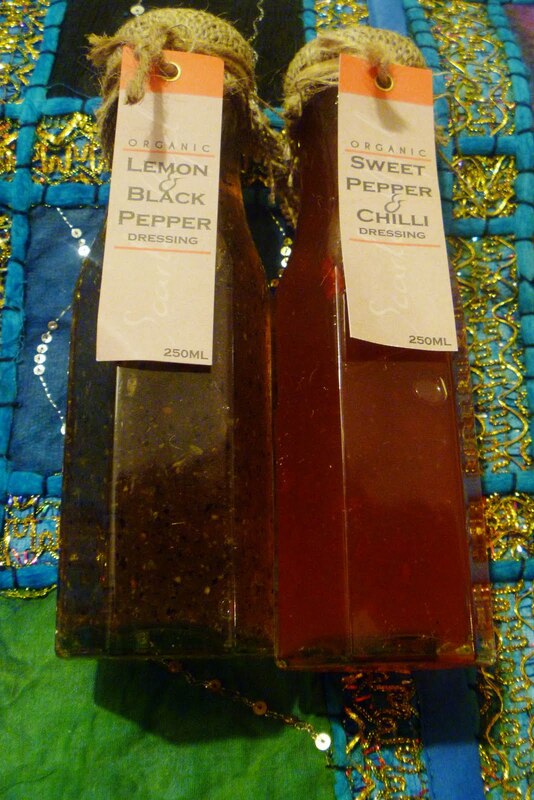 I sampled and purchased the sweet pepper and chilli which was really rich, sweet and tangy and the lemon and black pepper dressing which was really rich and fragrant. 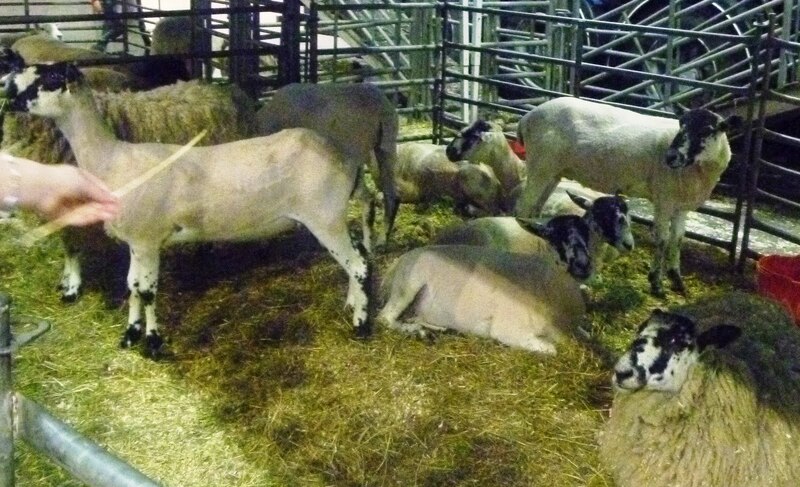 In addition to wonderful food, my daughters enjoyed meeting the various farm animals at the exhibition and watching the dance sheep on stage. All in all, we had a fabulous day out and left the festival feeling very full indeed. 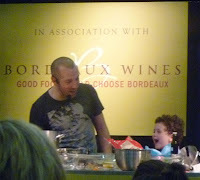 My thanks goes to Nick at my Daddy Cooks for the tickets.